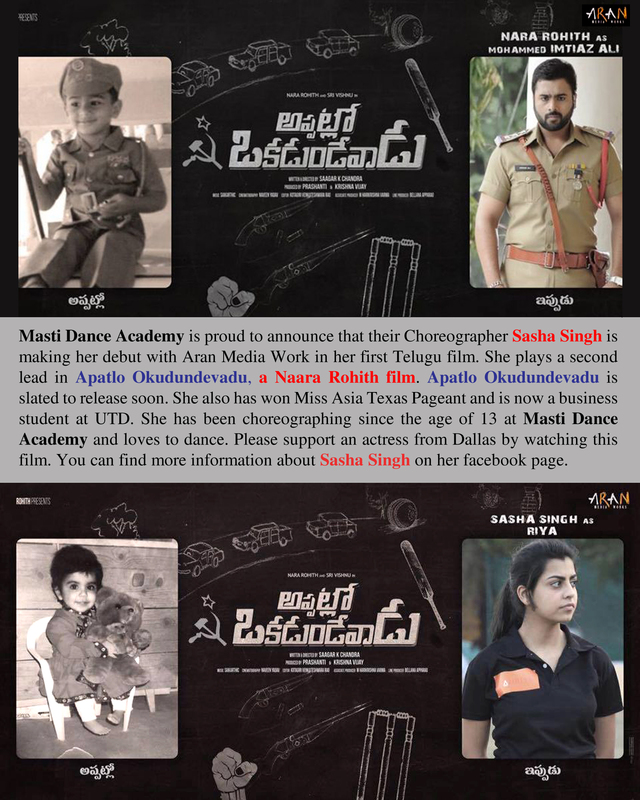 I was recently contacted by Texas based Masti Dance Academy to help interview Sasha Singh who is all set to make her Tollywood debut in the soon to be released movie Appatlo_Okadundevadu. Did you always want to be actor? Yes actually I did. I started dancing when I was just three years old and have been learning different forms like Hip Hop, Jazz, Bollywood and loved performing and being on stage. I got into acting when I was 12 years old when I stared doing theatre in school and that is when I realized my passion for acting. In fact as a child, whenever I was asked what I wanted to do after I grew up, I would always say I wanted to be an actress. How did you land your role in Appatlo_Okadundevadu? I was in India for a year at Mumbai when I auditioned for a lot of roles and then got this one. How was it working in an alien language? Yes I did not know Telugu and it was my first time in South India as we shot in Hyderabad. But the cast and crew made me very comfortable and spoke in English. As my part was dubbed, I only had to concentrate on acting and ensuring I was playing my part well. Tell us about your role in the movie? Am not allowed to say much but I play a 18 year old and since I turned 18 last year, the role is close to my heart and I could connect with the part. I don’t have any romantic part here nor am I paired opposite anyone. I play this character who is searching for this guy and I put clues together and take the movie forward. Were you apprehensive to play the second lead in your first movie? I have been looking to do movies for a while and most roles I had got until this one were not good enough as I was looking for something that would focus on my acting and not so much on glamour. And I found that in this role as I found that the script was very strong. So it did not bother me much that I was not playing the lead. The crew never treated me differently from the hero or heroine. How do you choose your scripts? It may sound like a cliche but I would like to do something different. For this movie, it is like a period film set in the 90’s and is not a typical masala or mainstream film. Of course I love masala movies too but this is a new story and the focus is on the subject. Generally speaking I think what matters most is a strong script and a story that has an message. For me the point of a movie is that it should some kind of positive impact on the audience. Have you signed on something new? Currently I have not not signed on any new movie but am in talks for a couple of them. There are also a few local projects in Dallas that I am working on. Do you have a dream role in mind? I would love to be part of a biopic, of a known person in any field, who has made a difference. I think playing a real life person can be very exciting. Favourite Actor: Imran Khan, Varun Dhawan. Favourite Cuisine: Thai, but after spending much time in Hyderabad for the shoot it has to be Biryani. Previous Previous post: How to Handle a jealous Co-Worker? Nice post and it is very informative.